Diwali, the Hindu festival of lights (and firecrackers), is the time blockbuster vacation-time films are released in India. But it's been fireworks of the political kind this Diwali over a film, Mersal, that hit screens in the southern Indian state of Tamil Nadu last week. Mersal is a crowd pleasing film about a vigilante hero seeking to shine a light on the ills commoners suffer due to political interference and apathy in the healthcare sector. The title of the film is a newly minted word that young people in Tamil Nadu have coined to refer to a "pleasant shock". However the film and its hero, Joseph Vijay, were in for a rude shock. Following the movie's release, the state chief of India's ruling Bharatiya Janata Party (BJP), Tamilisai Soundararajan, alleged that the film had "offensive lines" and accused it of "criticising" the federal government's schemes. She called for the removal of the lines and accused Vijay of mouthing politically loaded lines to further his political ambitions. 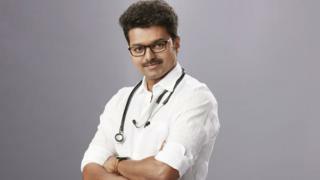 In the film, Vijay plays a character named Dr Maran, who takes a hard look at the state of public healthcare in the country. In the controversial climax scene, Dr Maran takes up the recent introduction of the Goods and Services Tax levied by the federal BJP government led by Prime Minister Narendra Modi. In June, India replaced its numerous federal and state taxes with the GST, designed to unify the country into a single market. Under the new system, goods and services are taxed under four rates - 5%, 12% 18% and 28%. In the film, Dr Maran asks why a country like Singapore levies "lower GST and yet provides free healthcare while India has a GST of 28% and yet cannot provide quality medical care". He goes on to question how a country that levies a 12% tax on medicines, charges no GST on alcohol "that makes women suffer". Women in rural India women generally link drinking by men with domestic violence, harassment and poverty. The hero in Mersal also lists many recent medical horrors in government hospitals across India. "How can government hospitals function without the crucial supply of oxygen cylinders?" he asks in one scene, in a clear reference to a recent tragedy in BJP-ruled Uttar Pradesh where more than 100 children died at a public hospital amid allegations that the oxygen supply was cut over unpaid bills. In another scene, Vijay refers to an "infant in an incubator dying of rat bite, something that can happen only in India". "People fear government hospitals and this fear is exploited by private hospitals", he says in the film. He also says India needs to build "more hospitals than temples". Tamil Nadu BJP leader H Raja accused Vijay of carrying on a "hate campaign" against Prime Minister Narendra Modi in the film. But Vijay's Twitter fans, who number over three million, aren't buying this. They have posted pictures of Mr Modi meeting the star during a visit to the capital, Chennai (Madras), in 2014, and accused the BJP of wooing Vijay's fan base for their votes. They have also wasted no time in making this a full-blown war between the Tamil actor and Mr Modi. The virtual war in Twitter with the hashtag #MersalvsModi raged on for several days. Leaked videos of a controversial scene from the film have been posted by fans, while opposition leaders have tweeted their support for Vijay. Congress leader Rahul Gandhi also called in his support with a tweet. Former finance minister P Chidambaram also hinted that the BJP was muzzling creative expression. Leading actor-filmmaker Kamal Haasan tweeted that Mersal had been cleared by the film censors and released and there was "no need to re-censor it". The producers of the film say that Mersal does not "propagate" against the government. "It is a film that speaks in support of free universal health care. The film's crux is the dream of a doctor," the producers said in a statement. Mersal's producer Hema Rukmani told the BBC on Sunday that while no scenes or dialogue have been deleted from the film, the producers had met local BJP leaders to "resolve differences". "We had an amicable meeting," she said. In the end, the Twitter war and public controversy over Mersal have helped fuelled interest in the film and made it a talking point - and a blockbuster - in Tamil Nadu.